I'm ready for tires & rims for my '62 B46 and I'm trying to figure out the rims for the Dayton hubs. I need six new tires and probably 6 rims too. It currently has 10.00 x 20 bias ply tube-type tires. The build sheet shows it originally came with 11.00 x 22.5 front & rear. It looks like I have a combination of three different 2-piece Firestone & Goodyear rims - some rims are 20 x 7.5. So, What is available that looks good? If it was was me I would go with 6 8.25X22.5 rims with new rubber, and your good to go! terry👍 also looks like a nice job on your restoration. 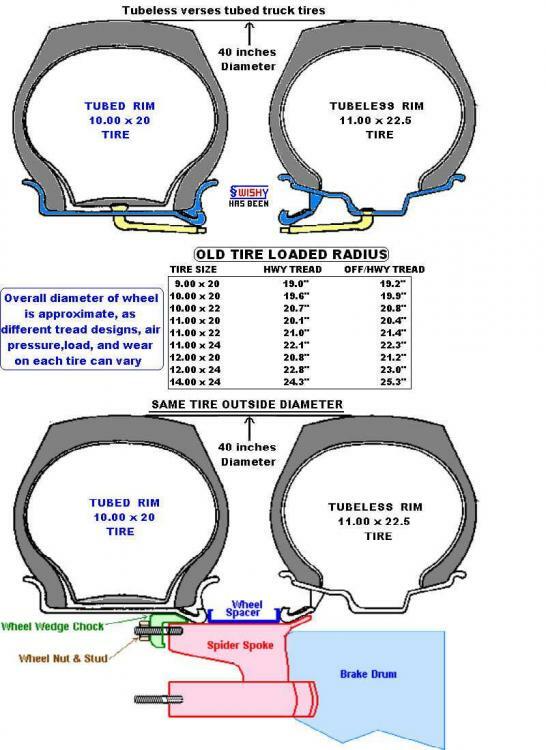 Agree with Terry new rims that will accept 11R22.5 radial tires. Tubeless one piece 22.5" rims available Anywhere, USA will be the way to go. First upgrade I did 15 yrs ago. Back in then it was $1800 for 6 rims and Yoko tires. It hasn't gotten cheaper!! The truck would look period-correct with 20" rims and tube-type tires, but 22.5 tubeless are way more common now and they ride much better. Way easier to repair also. Agree with everyone else 22.5 tubeless. I bought 2 new lo pro 22.5 steer tires for mine they are road master by cooper a cheep china tire. They where $300 each. 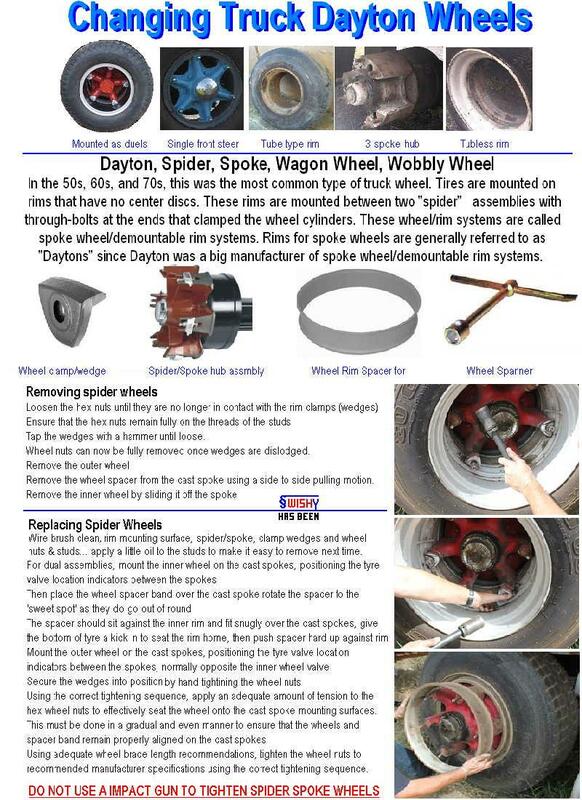 I've seen two ways to lessen the "unsightly" gap 22.5 rims leave on a Dayton style wheel. One was a ring that snapped over the gap and really looked quite nice. The one I seen on a truck was polished stainless and really carried the appeal and the other was the inner space of this gap powder coated a contrasting color. The one I'd seen was white in this space where the hubs were red, and the rims gray. 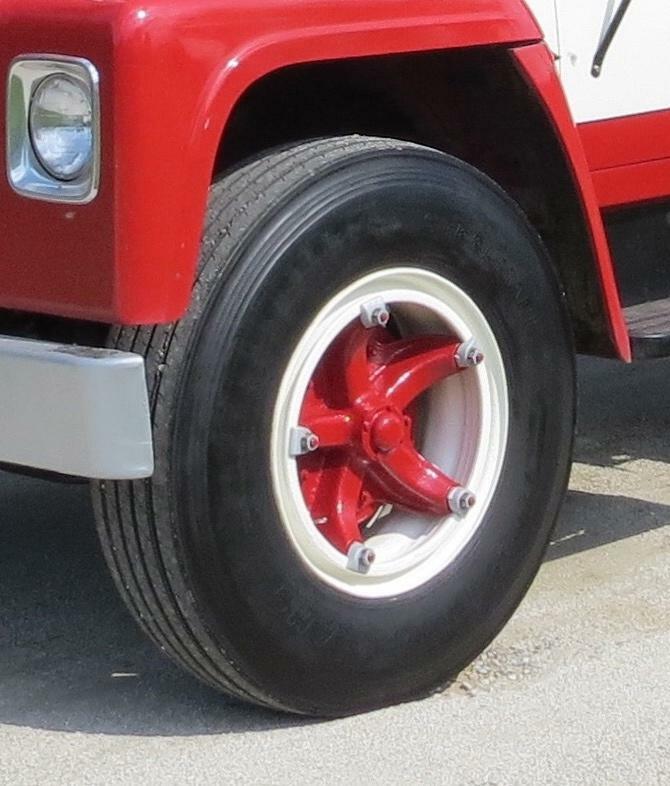 The hubs were painted but the rims were very nicely powder coated. 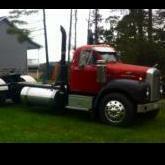 The truck was an IH "Westcoaster" long nose. Really went together nicely but caught my eye because of the Dayton hubs. The truck was originally from Oregon IIRC. In between the main body of the rim and the bead seating area. On a tube type wheel the lock ring is there. On a tubeless type there is about a 1" gap. On the drives you don't see it as the gap is to the inside. 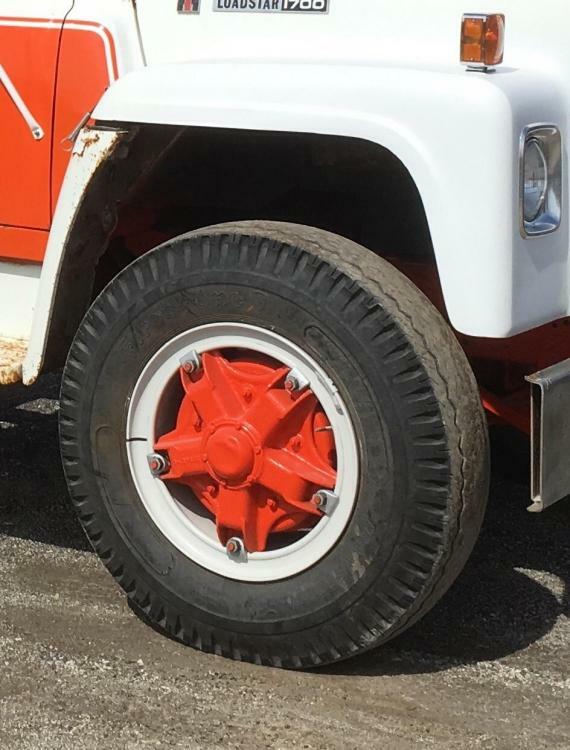 On the steer axle the gap is facing outward. I suspect I won't like that gap but... Any pictures of mounted 22.5's and that gap? And that "fix" to hide the gap. If I didn't know better and have the split rims to compare, would I know the difference? You will see it but it's not obnoxious. Look at Freightrain's recent post of painting his wheels. Look at the front rims and compare to your split rims. No photos of the stainless trim rings but I've never seen them anywhere else so may be custom made. I don't know anyone that has been happy with Cooper Roadmaster tires long term. That is just my observation and I ran Cooper tires on everything for many years. Tires are not the way to save money, my opinion. I know it’s hard to justify but it’s according to how much driving you’ll do. New cheap tires don’t seem to last long. At least put some good steer tires on. I'm not sure if this helps. My 2 cents. Everyone is giving good advice . Tubeless is the way to go. They are easier to buy and , a way easier to get someone to work on them. If U B runnin Wedge brakes the drum D is 15"
I can't say I've ever seen a set on a trailer but they sure don't hold up on a steer axle from several installs I've witnessed. I seen one pair cupped and chunked out so bad at 30K the selling dealer gave 100% refund towards a new set of Bridgestone steer tires. These were 295 R-22.5 tire size. For a hobby truck unloaded personally I don't think you would have an issue with the road masters. It's not like your going to be running 2,000 miles a week loaded. Mine run straight and smooth, they are "RM185A" model. I know a guy that ran them on his covered wagon hauling steel and they lasted 1/2 as long as a $600 name brand tire, but cost 1/2 as much too. This is the wrong time of the year but closer to winter you could prob get some used drive tires that someone wants to replace. They wouldn't be good enough to work with but plenty good for a toy. Then again I think your from Florida so that may not work out at all. Good on ya Keith. Old fashioned lead weight static balance, (hard to dynamic those old nylon tires...... Thanks for rounding up the photos. I don't have anything on 22.5" rubber with Dayton hubs. I do have an R model w/24.5" rubber and the gap is the same vs. the 22" rubber they replaced. The rear rims look quite different too...the 20's are flat and smooth, the 22.5s are sculptured. I didn't get a chance to thank keith s for sharing his build . Thanks so much Keith , Its very interesting thread. Okay, tires/wheels/rims look much better than I thought. A picture is worth... well, pictures are free so I guess it's the price of the camera. I'll stop at the tire/rim shop and order the 22.5 rims and tires. SnowDog, 2 miles/gal !!! Gallons, not litres. The cost of that electric Mack is looking better (once it's built). I'm hoping for 140 miles (city driving) for about $5. Probably 70 miles for $5 "cruising". If the battery charge is really low (not a good idea), figure 4+ hours to recharge.